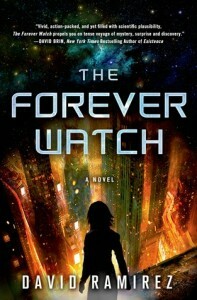 Review: The Forever Watch by David Ramirez – Escape Reality, Read Fiction! As a City Planner on the Noah, Hana Dempsey is a gifted psychic, economist, hacker and bureaucrat and is considered “mission critical.” She is non-replaceable, important, essential, but after serving her mandatory Breeding Duty, the impregnation and birthing that all women are obligated to undergo, her life loses purpose as she privately mourns the child she will never be permitted to know. When Policeman Leonard Barrens enlists her and her hacking skills in the unofficial investigation of his mentor’s violent death, Dempsey finds herself increasingly captivated by both the case and Barrens himself. According to Information Security, the missing man has simply “Retired,” nothing unusual. Together they follow the trail left by the mutilated remains. Their investigation takes them through lost dataspaces and deep into the uninhabited regions of the ship, where they discover that the answer may not be as simple as a serial killer after all. What they do with that answer will determine the fate of all humanity in this thrilling page turner. If you threw Gorky Park, Blade Runner, one of Robin Cook’s medical thrillers and Anne McCaffrey’s The Ship Who Sang into a blender, you might come up with something like The Forever Watch–but it probably wouldn’t be half as good. Not even if you added in elements of The Matrix and Madeline Ashby’s Suited. It’s not just that all of those elements are in The Forever Watch, but that they are melded into a single story that left me gasping in marvel at the end. I’m having a hard time letting this one go. I’m having an even harder time figuring out how to encapsulate the experience. The story starts with familiar concepts. Hana Dempsey is a City Planning engineer on the generational ship Noah. Her job, her entire department’s job, is to make the city more energy efficient, while still being livable, so that the ship will have enough resources to reach Canaan. In other words, the promised land. The mission is to save the human race. The ship is over two centuries out from a destroyed Earth, and has eight centuries yet to travel. That’s a long time for hundreds of thousands of human beings to be trapped inside a flying tin can — no matter how big or well designed the can might be. Perpetuating the human species is not even left to chance. Every woman is assigned Breeding Duty, where she spends the entire pregnancy in a medically induced coma. She is supposed to remember nothing of the process. The child might not even be hers. She’ll certainly never see him or her. Hana Dempsey comes back from her Breeding Duty with a sense that her life is as empty as she is. Duty is no longer enough. Her friend, Leonard Barrens, tries to help her fill that void with helping him on a personal quest. Barrens is a cop, and he’s been quietly looking into a series of gruesome and inexplicable murders that no one seems to be investigating. Instead of being looked into, or even merely filed away, all trace of these murders is being systematically wiped from the system. Barrens needs Hana’s skills to help him hack the vast computer system, the Nth Web, in order to find whatever traces are left. His mentor was one of the victims of what appears to be a serial killer named “Mincemeat” for the way he leaves his victims, and Barrens feels compelled to discover why the evidence keeps disappearing. Hana gets involved because she needs something to absorb her. And because she has always cared for Barrens more than she is willing to admit. In the testing enforced caste system on the Noah, the differences between a cop and a manager in the City infrastructure are huge. Hana and Barrens only know each other because Barrens rescued her after an assault. He makes her feel safe. She makes him feel cared for. But she’s used to Barrens being there in her darkest moments, and she’s in one now. His quest gives her something to do, something to be take her out of her empty self. And finally a way for them to reach out from beyond their society and self-imposed barriers for each other. Until the secrets that they uncover tear not just them, but their entire world, asunder. Escape Rating A+: I loved this book so much that I immediately started inflicting it on other people–my husband read it in one sitting (it’s 500 pages!) and now a friend has started to devour it. The Forever Watch exemplifies some of the best of science fiction, in that as soon as you read you start thinking about the society and what might have brought the race to this sorry pass, and it drives you crazy because the way things have worked out make you uncomfortable. Yet it’s impossible to stop reading, because that same discomfort makes you desperate to figure out why this is the way that society went. It doesn’t seem logical, and yet it all hangs together perfectly. Even more amazing, every single bit of where it seems that things make no sense within that society, are all resolved at the end, and in a way that upholds the willing suspension of disbelief. What lengths would we go to in order to save the human race? How far do the needs of the many outweigh the needs of the few? What secrets are so horrible that suppressing them is better for society than full knowledge, and who has the right to decide? How much can be justified by the cold equations of survival? You will end up with more questions than answers, but you will not be able to get this book out of your head. Pingback: The Sunday Post AKA What’s on my (Mostly Virtual) Nightstand 4-27-14 | Escape Reality, Read Fiction!